A factory portrait of D5010 prior to entering traffic. Points of interest are the full size fuel & water tanks, the Athermos axleboxes, the two-rung bogie mounted footsteps, the ridged sandboxes and the circular engine exhaust in its original position above the boiler room. The sixteen year three month career of D5010/24010 commenced with just over three years on loan to Hither Green before transferring to the London Midland Region and finally the Scottish Region. April 6th 1959 to Hither Green (73C) on loan. May 1962 to Aston (21D). January 25th 1969 - withdrawn (stored Chester). July 29th 1969 - reinstated to Stoke Division (D05). 24010 was stored at Carlisle from July 1975 until March 15th 1976 when it moved to Glasgow Works, then moved to Doncaster Works on July 15th 1976, where it was broken up during January 1977. Movement (2): 24010/17/97 Glasgow Works – Doncaster Works July 15th 1976 (behind 20017 at Darlington). Noted Eastleigh Works January 1961. Noted Derby Works January, March - June, August 1963. Noted Derby Works May, June, September 1964. Built with 4/4 grilles on non BIS side, 3/4 on BIS side. Full size fuel & water tanks. Athermos axleboxes. Two-rung bogie mounted footsteps. 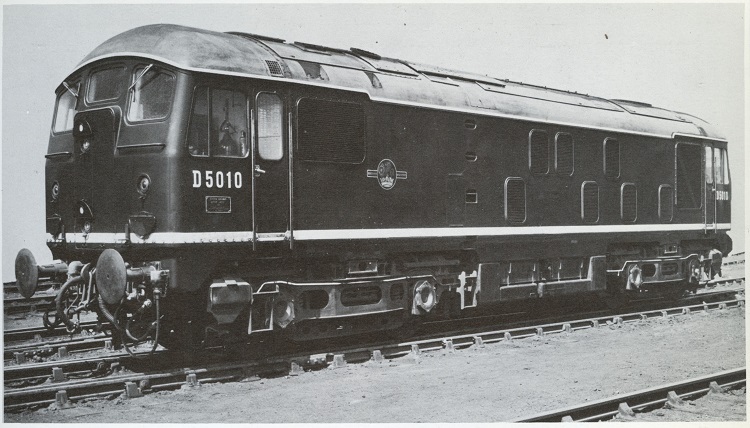 D5010 was one of fifteen Type 2s loaned to the Southern Region pending delivery of the BRCW Type 3's. Headcode brackets were added to the cabfronts shortly after arriving on the Southern Region. These remained on the locomotive until withdrawal. The ‘SR’ Type 2s now numbered fifteen but had been subdivided into two distinct groups, those with their boilers removed (D5002 - 5006), and those still as built (D5000/01/07-14). On the Eastern section all were banned between Tonbridge and Bo Peep Junction, Middle Junction to Sheerness on Sea and from the Tilmanstone & Tenderten branches. The heavier machines were also banned from the Allhallows, Grain, Hawkhurst and Westerham branches. Oddly all were allowed down the steeply graded Folkestone Harbour branch. On the Central section the only restrictions applied to the heavier machines, banned between Three Bridges and East Grinstead and onto Ashurst Junction and the Heathfield line. The Cranleigh, Kemp Town, Lavant & Steyning branches were also off limits. On the Western Section all were banned from the Bodmin North, Barnstaple & Ilfracombe, Callington, Halwill, Hayling Island, Lyme Regis and Torrington branches. Double heading of these machines, with themselves or other engines was not permitted except on short trips. Freight workings using the Type 2s included the 3.05pm Hoo Junction - Hither Green freight, noted in April were D5005 (6th), D5009 (7th), D5010 (8th), D5000 (9th) and D5005 (10th). November 14th found D5010 working a football special from Ashford to Brentford. Whit Monday, June 7th saw thirty nine excursions return from Blackpool, the majority were steam hauled, however the 19.00 to Coventry was graced with D5010. Condition unknown date (but believed whilst on WCML): green livery with small yellow warning panels, rounded upper corners, painted over frame level stripe, three rung bogie steps, SKF axleboxes, headcode disc brackets fitted (for use with SR six disc headcodes), full size fuel and water tanks, blanking plates fitted. On July 22nd D5010 worked the 07.25 (SO) Birmingham New Street - Barmouth passenger service (throughout?). Condition July: green livery with small yellow warning panels, squared upper corners, warning panel covers frame level stripe, full size fuel tank, shortened water tank, no blanking plates, hand/footholds present, SKF axleboxes, headcode disc brackets fitted (for use with SR six disc headcodes). Chaos reigned at Chester in the early hours of July 9th after the 02.25 Birkenhead - Etruria iron ore train, weighing approximately 1,000 tons and hauled by 1617 was reported out of control and diverted into the diesel depot to avoid the station area. Two locomotives and eleven wagons were derailed, with 5031/43/93 & 5138/39 extensively damaged. The crew escaped major injury, though were treated for shock, not surprisingly. The latter four machines were quickly placed to store at Chester and then withdrawn during August, joining stored machines 5007/10/17/19 already there. No doubt because of the loss of these five Type 2’s it was not unexpected that a number of the stored examples would be returned to traffic, those reinstated were 5010/11/16/17. Condition Final: blue/yellow livery, gangway doors sheeted over, headcode discs centered on cab front; full size fuel tank, shortened water tank, blanking plates fitted, hand/footholds plated over, three-rung bogie mounted footsteps, straight sided sandboxes, headcode disc brackets fitted (for use with SR six disc headcodes) (both cabs), side ventilators 3/3 BIS, 4/4 non-BIS side. BIS side: lower row of ventilators numbered three, the ventilator located in the triangular generator access panel was not present: ?? - until withdrawal. Page added May 11th 2016.